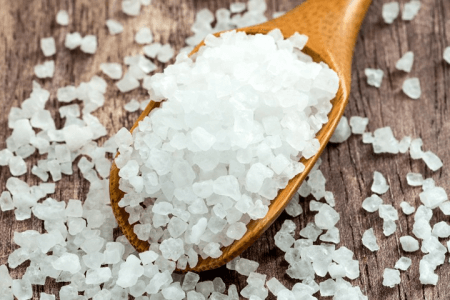 If you are an avid reader of beauty and wellness blogs, you surely have come across the term “Epsom salt.” However, despite its popularity, some people still do not know what exactly it is. If Epsom salt is not available, can you use sea salt instead? Are they different? This article will discuss the difference between the two. Epsom salt is technically not salt. It is an inorganic mineral compound of magnesium, oxygen, and sulfur in colorless crystal form. It is less commonly known as magnesium sulfate (MgS04-7H2O). It is named “Epsom” because it was first discovered in Epsom, England. It is also named “salt” because of its appearance. Because of its magnesium content, Epsom salt is widely known for its therapeutic benefits. Many wellness experts suggest soaking in a bath with Epsom salt to soothe aching muscles, cure skin problems, heal wounds, relieve stress, and release toxins from the body. It is also believed to leave your skin soft. Additionally, Epsom salt is widely used in small and large-scale agriculture to improve plant condition. It is also used in other industries for leather tanning and fabric dyeing. Sea salt is a type of salt that is collected by drying sea water. If you look closely, it is in the form of cloudy white crystals. Like other types of salt, it has a significantly high level of sodium chloride (about 97.5%). It may also contain magnesium, potassium, and iodine. The mineral content of sea salt contributes to its therapeutic properties. It can be used for cleansing and detoxifying the skin. However, soaking in a sea salt bath more than once a week is not recommended as it has a drying effect on the skin. Sea salt is a kitchen staple. It is edible and can be used in various food preparations. What, then, is the difference between Epsom salt and sea salt? Epsom salt is a chemical combination of magnesium, sulfur, and oxygen (MgS04-7H2O), whereas sea salt is mainly sodium chloride (NaCl), with small amounts of iodine, magnesium, and potassium. Epsom salt is produced by a chemical process or by boiling, while sea salt is collected by evaporating sea water. Epsom salt is transparent, whereas sea salt is cloudy white. Epsom salt is popular for its capability to soothe sore muscles, cure skin problems, heal wounds, and relieve stress. Sea salt is known for its ability to cleanse the skin. Epsom salt baths can be taken frequently because they have a softening effect on the skin, whereas sea salt baths can only be taken occasionally because of their drying effect. Additionally, Epsom salt is not primarily used for culinary purposes, unlike sea salt. Epsom salt can be ingested, but only in limited amounts. Epsom salt has a bitter taste while sea salt has a salty taste.